Mr Vegas is a popular online 3D video slot game, with a cartoon feel, which is guaranteed to help gamblers escape from their regular lives. The game was developed by Beftsoft gaming, and is a depiction of Las Vegas. It has the real casino gambling feel with beautifully animated casino ladies, who become a distraction when a player hits a winning combination as they toast to your win with champagne. Mr Vegas has a standard video slot game layout. Five-reels, thirty pay-lines and three-rows. Added to this is a progressive jackpot for players to win. Players can place bets on the pay-lines between $0.02 and $150. The coin size is between $0.02 and $1. The game allows players to bet a maximum of 150 coins in a single spin with a maximum quantity of five coins per pay-line. The game has a Las Vegas theme, revolving around the character Mr Vegas and the events which occur in a Vegas casino. the pokie contains spinning roulettes, luxury champagne and expensive jewellery to give you that authentic Las Vegas casino atmosphere. The game itself contains blackjack, big wheel spins and roulette, with Jazz sound effects that liven up the atmosphere. The animation of the game and the graphics are of top-quality and is certain to keep players captivated throughout. Mr Vegas has a free spin feature, bonus round, money wheel jackpot and a minimum slots bonus. There is a Mr Vegas icon, and if the icon lands on the first, third or fifth reels instantaneously, you get transported to the roulette bonus feature. In the roulette bonus feature an animated Mr Vegas will walk up to a roulette table and choose numbers. This bonus will result in Mr Vegas’ selected number appearing on the roulette table. There is a money wheel jackpot, which is triggered by any winning combination, as long as the symbols forming the winning combination have a pizza-slice icon on their corners. If you get five of these symbols, you will be allowed to spin the big wheel and get great prizes. Prizes include bonus rounds, progressive jackpots, free spins and free casino credits. Players can trigger the free spins round by landing the dice symbol on either the left or right side of Mr Vegas on the first, second and third reels. The number on which the dice lands, is the number of free spins which will be awarded to you. The free spins bonus round has a 2x multiplier, allowing you to multiply your spins. When you get three or more one-armed bandit symbols, you will trigger the minimum slots bonus which awards you with free spins on a different mini slot machine. 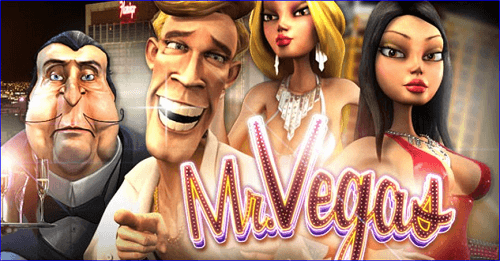 The online casino game, Mr Vegas, is an amazing variant of Betsofts’ video slot games, with many different bonuses on offer and a great gameplay setting. The game can also be enjoyed on a variety of platforms including desktops and mobile devices. There are no limits to the fun you could have.